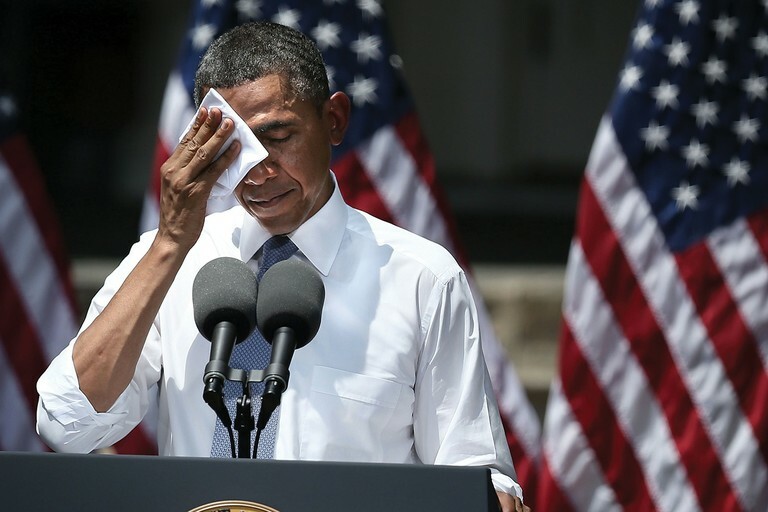 President Obama wipes perspiration from his brow, for impact, during a speech about global warming climate change under a hot, though not unusually hot day at Georgetown University, June 25, 2013. Judith Curry – where data and evidence trump alarmist-activism, masquerading as “science”. The testimony from each of the witnesses is now online [here]. The link for my testimony is [here]. I would like to thank the Committee for the opportunity to present testimony this morning. I am Chair of the School of Earth and Atmospheric Sciences at the Georgia Institute of Technology. I have devoted 30 years to conducting research on topics including climate of the Arctic, the role of clouds and aerosols in the climate system, and the climate dynamics of extreme weather events. The premise of the President’s Climate Action Plan is that there is an overwhelming judgment of science that anthropogenic global warming is already producing devastating impacts. Anthropogenic greenhouse warming is a theory whose basic mechanism is well understood, but whose magnitude is highly uncertain. Multiple lines of evidence presented in the recent IPCC 5th assessment report suggest that the case for anthropogenic warming is now weaker than in 2007, when the 4th assessment report was published. The IPCC does not have a convincing or confident explanation for this hiatus in warming. Based on expert judgment in light of this evidence, the IPCC 5th assessment report lowered its surface temperature projection relative to the model projections for the period 2016-2036. The growing evidence that climate models are too sensitive to CO2 has implications for the attribution of late 20th century warming and projections of 21st century climate change. Sensitivity of the climate to carbon dioxide, and the level of uncertainty in its value, is a key input into the economic models that drive cost-benefit analyses, including estimates of the social cost of carbon. If the recent warming hiatus is caused by natural variability, then this raises the question as to what extent the warming between 1975 and 2000 can also be explained by natural climate variability. In a recent journal publication, I provided a rationale for projecting that the hiatus in warming could extend to the 2030’s. By contrast, according to climate model projections, the probability of the hiatus extending beyond 20 years is vanishing small. If the hiatus does extend beyond 20 years, then a very substantial reconsideration will be needed of the 20th century attribution and the 21st century projections of climate change. Attempts to modify the climate through reducing CO2 emissions may turn out to be futile. The stagnation in greenhouse warming observed over the past 15+ years demonstrates that CO2 is not a control knob that can fine tune climate variability on decadal and multi-decadal time scales. Even if CO2 mitigation strategies are successfully implemented and climate model projections are correct, an impact on the climate would not be expected for a number of decades. Further, solar variability, volcanic eruptions and natural internal climate variability will continue to be sources of unpredictable climate surprises. As a result of the hiatus in warming, there is growing appreciation for the importance of natural climate variability on multi-decadal timescales. Further, the IPCC AR5 and Special Report on Extreme Events published in 2012, find little evidence that supports an increase in most extreme weather events that can be attributed to humans. The perception that humans are causing an increase in extreme weather events is a primary motivation for the President’s Climate Change Plan. However, in the U.S., most types of weather extremes were worse in the 1930’s and even in the 1950’s than in the current climate, while the weather was overall more benign in the 1970’s. The extremes of the 1930’s and 1950’s are not attributable to greenhouse warming and are associated with natural climate variability (and in the case of the dustbowl drought and heat waves, also to land use practices). This sense that extreme weather events are now more frequent and intense is symptomatic of pre-1970 ‘weather amnesia’. The frequency and intensity of extreme weather events is heavily influenced by natural climate variability. Whether or not anthropogenic climate change is exacerbating extreme weather events, vulnerability to extreme weather events will continue to increase owing to increasing population and concentration of wealth in vulnerable regions. Regions that find solutions to current problems of climate variability and extreme weather events and address challenges associated with an increasing population are likely to be well prepared to cope with any additional stresses from climate change. Nevertheless, the premise of dangerous anthropogenic climate change is the foundation for a far-reaching plan to reduce greenhouse gas emissions and reduce vulnerability to extreme weather events. Elements of this Plan may be argued as important for associated energy policy reasons, economics, and/or public health and safety. However, claiming an overwhelming scientific justification for the Plan based upon anthropogenic global warming does a disservice both to climate science and to the policy process. Good judgment requires recognizing that climate change is characterized by conditions of deep uncertainty. Robust policy options that can be justified by associated policy reasons whether or not anthropogenic climate change is dangerous avoids the hubris of pretending to know what will happen with the 21stcentury climate. Senate EPW Hearing on the President’s Climate Action Plan. Watch yesterday’s blockbuster performance by Dr. Roger Pielke Jr. and Dr. Roy Spencer at Senate climate hearing | Watts Up With That?